But as Muriel continued to speak, and connect with me on an energetic level, I began to understand her role, and came to realize, she has always been with me. Historically Muriel has been known as the “Perfume of God”, her name based on the Greek word for the fragrance myrrh, and while Clairalience (the psychic sense of clear smelling) is by no means my strongest sense, when Muriel is near I will often smell the sweetest, subtle floral fragrance. Archangel Muriel helps all who call upon her, but is especially connected to those who are empathic, or struggling with emotions. Muriel also assist individuals who are ready to open up intuitively to the next level. Muriel will surround you with angelic love, peace, and harmony- helping you to understand what emotional energy is yours and what you are feeling which actually belongs to another. Muriel will work with you to awaken your spiritual light and clairsetinence, or otherwise known as clear, psychic feelings. Muriel will also help you to learn to trust the wisdom of your heart and the intuitive guidance of your soul. This serves to bring increased passion and certainty to take action and move in the direction of your dreams, and authentic purpose. When working or calling upon Archangel Muriel, don't be surprised if your inner humanitarian begins to emerge. You may receive information on how you can joyfully serve and assist both yourself and others. Or, when seeking to determine your next steps and path, Muriel can be a huge support when at a cross roads of sorts, she will help you to understand your emotions which are present, and clearly see the path through. Muriel is also very helpful to call upon for assistance with gardening, healing pets, or grounding the healing energy of unconditional love, peace and harmony into your own life, and physical being. Or in the Ascension Angel Meditations Pack! For many years now Ihave been communicating with my guardian angel Muriel ,she has been an inspiration to me and a good friend , Can it be that ones guardian angel is shared by many? I have recently been made aware of the name Kaziel, I feel Kaziel is my new spirit guide . I would be interested to know your thoughts , Cana guardian angel be shared by many ? 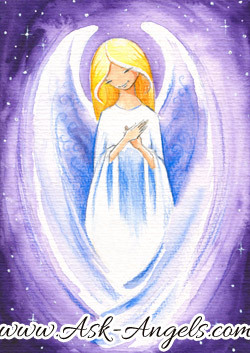 Hi Linda, Your guardian angel only works with you… By nature guardian angels work with individuals… Archangels however work with entire groups of people and you can have a close connection with Archangels as well as Guardian Angels.. I recently connected to a lady who says she is Muriel so i was looking up the name. She also said she is the Archangel Michael twin flame. I have come across many ladies who say they are Michael’s twin. Some say they are the Archangel Faith. I personally believe names are more for our humanity so we can relate but those known names are collective in nature? I think I heard Archangel Muriel whisper in my ear last night. That name was repeating in my dreams last night over and over again. Im not sure what it meant but it was rather odd. But the craziest thing is I felt peace. No fear just peace. Its like a broken record in my head. That is all hear. I was told in the past that I am an empath. I havent used my gift in years….. Maybe because I shut myself out from everyone, maybe because I got tired of feeling all those negative energies, or maybe I sensed more darker energies and it scared me, who knows. But its like the archangel wants me to open myself again…..what should I do? Tonight, just after taking pics and spending time under my pink full moon, I came across this. It’s beautiful and has touched me and made me so happy and grateful. I am going to ask Muriel to come into my life. I believe she was guided to me. With much Gratitude, Thank you for sending Muriel my way?
? I loved this, beautifully written 🙂 Thank you x ….Archangel Muriel is one of my angel companions and does exactly as you have written here! You wrote Muriel’s role in my life perfectly, it was wonderful to find it in someone else’s words! ? Oh wow! Archangel Muriel… Just lovely. Thank you for introducing me to this angel, especially now as I’m detoxing from an addiction and dealing with emotions I have been numbing for a long time. ive also sensed that through the release of this addiction, my intuitive abilities will be heightened. How fitting that Angel Muriel has stepped into my awareness at this time. As for what Charlotte said, I wanted to say that I had a very different reaction to seeing that you now sell things on this site. You have offered so much value freely and generously all this time. I was very pleased to see that we now have a way of supporting your efforts with more than just comments. Happy thoughts and gratitude will certainly attract abundance, but that doesn’t do much good if you remain closed off from receiving it! To Charlotte J. Roberts, at this time the energy the collective gives out does not “support” in a way for people to “help out” in that manner. All beings of love & light though are propelling everyone to move forwards in that direction, and Earth indeed currently has a lot of Lightworkers currently on mission to help out, and when the divine timing comes, things will move accordingly to re-align the collective’s energy on Earth to accomodate a higher vibration :). I am sure you will be guided to find other means to connect to them too. To Melanie, I was connecting with Archangels just now, and the name “Muriel” popped up in my head. Did not know about this particular Angel, and decided to do a search for this Angel :). In response to Charlotte Roberts “MONEY” comment…if this were the spiritual realm, we would need only gratitude & energies of love to fuel us & not money. Angels who help us appreciate our gratitude towards them because that is what sustains them and ‘increases’ them. However, in the physical realm our method of sustaining ourselves is financial. The exchange of gratitude & methods of sustaining ourselves in the spiritual vs physical realms are different & necessary. Just as gratitude and energies of love are the ‘currency’ in the spiritual realm, our physical realm has currency we sustain ourselves with. I am interested, I love God’s Angels….. I knew sooner or later you would want MONEY…. We can never have PEACE, without there being a gimmick….. ?? Some thoughts, I hope you don’t mind!….People are paying for your time & resources, which I think is acceptable & fair ? ….Most services are charged for whether it’s a bus service, connecting to a wifi, seeing a doctor etc. Also have to remember that people are not paying for exclusive access to higher guidance, they can get that themselves for free with some patience & trust, listening, meditation etc. So there is no abuse or misuse of gifts or exploitation going on, unless the service provider is making it exclusive and creating a dependency in the client/service user. As long as it’s ethical then it’s a beautiful thing, a good service with a fair exchange. Also having higher guidance doesn’t make you rich without taking action, effort or hard work, but can guide you how to make the best out of your finances & resources, find the right attitude, speak the right words in alignment with what you want/need, the best approaches and the best jobs etc. ……It can guide you to be in the right time and place to get the money, job or financial support you need, that is the real miracle. They will intuitively guide you were to walk so you find that £5 note laying on the street, you exclaim “how lucky” ? Or if you have intuitive awareness you say “thanks”! I find higher guidance / angels guidance very practical rather than otherworldly/hard to attain X x x ?